"The Guru" is a web-based interactive education platform created as part of the GD400 Graphic Design studio at the NC State College of Design. Myself and my design partner McCall Cox conducted background research on web-based education platforms and engaged in user testing to identity issues with the services currently available. What we found was that, amongst other design problems, all services left their users feeling unsatisfied in regards to the amount of feedback they received (on their work, their responses to questions, and overall progress throughout their course). Using the motivation to improve the amount of feedback online education software could give to its users as a guide, we came up with the idea of the "guru" : an ultimate guide, tutor, book-keeper, coach, and pep-talker who is always there when you need them to be. 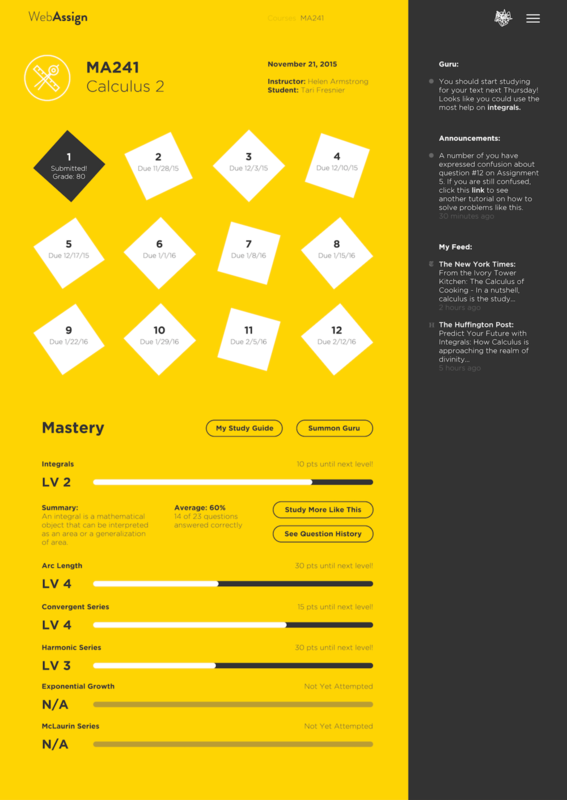 We then took this concept and personified it through our redesign of a current popular online-education tool. The Guru works to bring online education out of the "digital-only" realm and make it a fun and seamless experience for students. Users have access to their online course at any time, through their computer, or on their mobile device. The Guru will send them alerts and notifications reminding them when assignments are due or when tests are approaching, and can even offer a helping hand within assignments, identifying tricky-topics for smarter studying. With the Guru, students can isolate the topics with which they are having the most trouble and view study guides specially made to help them improve. Within the study guide, the Guru provides helpful tutorial-like guidance to make sure that students are progressing on the right track. And finally, for students that enjoy studying together, the mobile application can help pinpoint ideal study locations and aid members of the same classes get in touch with each other to form a group study session.